Jo H. Williams, age 84, of Battle Creek, Iowa (formerly of Danbury, Iowa) passed away on Saturday, April 13, 2019, at the Horn Memorial Hospital of Ida Grove, Iowa. 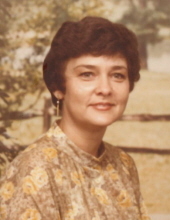 Jo H. Williams, the daughter of Joseph and Ura (Gilbreath) Cox, was born on August 22, 1934, in Fort Worth, Texas. She was raised in the Fort Worth area and attended school at Handley High School graduating with the class of 1950. After high school Jo began working for an insurance company until she met the love of her life, Sherman Williams. On April 20, 1953, Jo was united in marriage to Sherman Williams in Fort Worth, TX. The couple were blessed with three children: Gary, Sharen, and Donna. Jo enjoyed being a homemaker raising her children. Sherman was in the military so the family made their home in a variety of locations including Puerto Rico, New York, and Ohio. Eventually the family would settle in Bedford, TX. In 1995, Jo and Sherman moved to Danbury, IA to be closer to their daughter, Donna. Jo was most recently a resident at the Willow Dale Wellness Village in Battle Creek, IA. Jo enjoyed listening to country music and watching Western movies. She loved to sew, crochet, craft, and decorate cakes. She enjoyed putting jigsaw puzzles together and playing board games with her family. Left to cherish her memory include her children Gary Williams of Kerrville, TX, Sharen (Jim) Thompson of Kerrville, TX and Donna (Chris) Kallas of Mapleton, IA; grandchildren Chris (Katrena) Lee of Millsap, TX, Ryan Smith of Houston, TX, Garrett Smith of Austin, TX, Adam Kallas of Mapleton, IA and Tara (Joe) Arch of Papillion, NE; nine great-grandchildren and one great-great grandchild. She was preceded in death by her loving husband of 56 years Sherman Williams; her parents Joseph and Ura Cox; a daughter in infancy Theresa Jo; sister Billie Ramirez; and brother Ralph Cox. "Email Address" would like to share the life celebration of Jo H. Williams. Click on the "link" to go to share a favorite memory or leave a condolence message for the family.